Buy 1 for $57.60Buy 2 / Save $3.07!Buy 3 / Save $11.52! Medicinal properties of Valerian may include: Calmative, antispasmodic, nerve tonic, nervine, sedative, anodyne, and carminative, aromatic, emmenagogue. Valerian can also be tried to help support hypochondria, nervous headaches, irritability, mild spasmodic affections, diarrhea, migraine headaches, croup, hysteria, convulsions, vertigo, nervous cough, delirium, neuralgia, muscle cramps, gas pains, stomach cramps, spasms, palpitations, gas, colic, depression, panic attacks, emotional stress, PMS, menstrual cramps, despondency, insomnia. It is a potential supportive for fevers and colds. Valerian may be useful for expelling phlegm from the throat and chest, it can be tried to expel worms when everything else fails, and may be used for shortness of breath and wheezing. Valerian tea can be tried as an enema for pinworms and tape worms and externally as a wash for sores, wounds, chronic skin problems, and pimples. Like many botanicals, valerian has a long history. Named the "Herb of the 19th century," is recognized worldwide for the relaxing effect it seems to have on the body. Often, in Europe, it is tried to help support anxiety. Valerian does not taste very good, but it has few unpleasant side effects. For centuries, valerian has been a popular choice by herbalists when trying to help support panic attacks or nervous tension. The common name of valerian is heal-all, which comes from the Latin word valere, meaning "to be well". It is believed valerian is the spikenard referred to in the Bible as a perfume brought from the East. Valerian has a distinctive, rather unpleasant smell, and was aptly called phu by the Greek physician Galen. 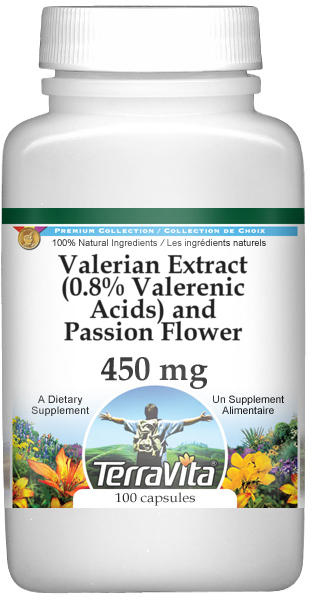 In recent years, it has been well researched, with chemicals called valepotriates developing in valerian extracts. These can be used to support a healthy nervous system. As a sedative, passion flower is the preferred herb for helping support insomnia and leaves no hangover. As an antispasmodic, it is helpful in central nervous system disorders, asthma (with much spasmodic activity), seizures, and hysteria. It supports nerve pain in complaints like neuralgia and shingles. Passion Flower can be used to help support nervous restlessness, anxiety, insomnia, depression, alcoholism and headaches. Passion Flower's gentle sedative properties produce a relaxing effect, reducing nervous over-activity and panic, and making it a mild and non-addictive herbal tranquilizer. It is an effective calmant and analgesic; its effects are primarily on the nervous system.